Former Brooklyn Dodgers General Manager Branch Rickey scoffed at the possibility of losing fomer farmhand Spook Jacobs to another franchise. Jacobs was signed by the Dodgers in 1946 and quickly ascended the ranks of Brooklyn’s farm system, moving from Class-D Thomasville to Class-AA Mobile by 1949. After batting .304 for Mobile in 1950, the White Sox made a run for Jacobs. 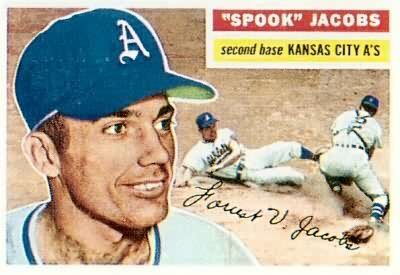 The recently deceased Jacobs discussed in a 2009 interview how Rickey would not sell Jacobs to the White Sox even though he was blocked at the major league level by Jackie Robinson. Bound by the reserve clause, there wasn’t much Jacobs could do except continue to play hard and hope for an injury at the big league level or a trade. After the 1953 season, the Dodgers left Jacobs unprotected and the Philadelphia A’s drafted him in what we now know as the Rule 5 draft. Jacobs started at second base for A’s the entire 1954 season, and continued with them for parts of the 1955 and 1956 seasons before being traded during the 1956 season to Pittsburgh where he appeared with them for 11 games. He finished with a career .247 batting average in 188 games played.